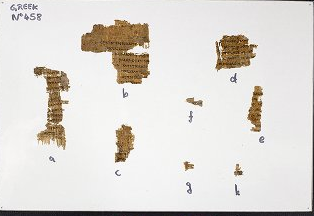 Click above to see (and zoom in on) the oldest known pieces of the Septuagint. From Brian Davidson’s great LXX blog. Yeah well, the link goes to nothing. And, just for kicks, how do they know this comes from any Septuagint? Link is fixed now–the url was correct when I first posted, but now it’s updated. How do they know? I assume they have enough text to make a match with other Deuteronomy LXX manuscripts. Is there something else behind the question? Ahhhh yeah, that there is less evidence for the Sept than there is for the fraud of the Sept. Why people are duped to its validity shows the utter desperation of the age we live in. I’m not sure what this has to do with any potential desperation of the world we live in. I appreciate the interaction, but I don’t find the view in the page you linked to compelling. How about the New Testament?